In the poem, George sings his ambitions etc to sleep, and advises his son to take a more moderate, relaxed attitude to life than he himself did. Part of that would be to not be impulsive with money. Solid advice, but the story behind it shows how complicated that was for George himself and for William. William and George are listed as son and father in the geneology of the gentry of Befordshire. William’s mother’s name is not given there, but his demise is described: “died in the voyage with Sir Francis Drake to St. Domingo of Carthagen.” That’s the Elizabethan way of denoting Carthagena, now in the Dominican Republic. George is listed in the geneology as the eldest son of Sir John Gascoigne, “knight Recorder of Bedford.” Sir John was a reasonably well-off landowner and Member of Parliament for the area. He did what fathers of his class were supposed to do at the time, sending George to Cambridge and then, in 1555, when he was 21, to Grey’s Inn in London to study law. Grey’s was one of four residences (called “Inns of Court”) located around the palace of Westminster that housed the courts and the great Hall and was the London home and administrative center of the Kings and Queens of England. The students there were all gentry, including some of the sons of the nobility like, around George’s time, Lord Grey of Wilton and the Earls of Oxford and Bedford. Grey and Bedford eventually became George’s friends and patrons. Few of the gentlemen at Grey’s were really studying law, or studying that much law. They were making connections and learning to become courtiers. They were learning to sing, to compose music, plays and poetry, to play instruments, to speak foreign languages, to act, and to fight. The Queen patronized Grey’s, saying that it “fitted youth for the future.” It was important to be able to devise and partake in entertainments. It was important to speak Latin, the language of diplomacy, along with Spanish and French, the languages of England’s great adversaries. As we will see, once George made it as a courtier, he was sent to Paris and Antwerp (controlled then by the Spanish) as a spy. The Queen could handle all these languages and some Italian. Also she wrote poetry, not (it’s safe now to say) the best, but passable, with the odd flash of a good line or metaphor. She used poetry as one (of many) possible tests of intelligence. While he was at Grey’s, George sat in place of Sir John in Queen Mary’s last parliament (1558), a time of great conflict between the Catholic Queen and her subjects who had been rigorously protestantized by her father and brother, Edward. George was in parliament when Mary’s death was announced. Then he served as a minor functionary (again replacing his father) at the coronation of Elizabeth I in 1558, an event greeted with rapturous joy by everyone but Catholics and the King of Spain, the superpower of the time and in effect the military arm of the Catholic Church, which at that time was the religious arm of the King of Spain. George’s wife, William’s mother, was Elizabeth Bacon Breton, even better connected than George but a widow when she married George, with four kids — one of them, Nicholas, turning into a poet and publishing his first works in the mid 1570’s when George was publishing his. She was the daughter of John Bacon, related to Sir Nicholas Bacon, Lord Keeper of the Great Seal and the father of Sir Francis Bacon, who grew up to be a famous essayist and scientific theorist. 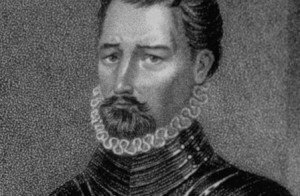 Sir Martin Frobisher, working his way up to being one of the Queen’s most trusted admirals, was another relative. In addition to these impressive connections, Elizabeth had a considerable fortune, including a big house on Red Cross Street, left to her by her first husband, William Breton. But the condition in the will was that she not re-marry — Breton was worried about the inheritance of his children. Elizabeth flagrantly ignored the will. She married George on the 23 of November 1561, only three months after Breton’s death. Not only that, but she married him despite being promised to one Edward Boyes. She might have been trying to escape Boyes, the choice perhaps of her family, but she was likely also smitten by George. He was, as his writings show, witty. He was tall (“long George” to his friends), strong, and good-looking — or at least, he drew pictures of himself as such. These pictures occurred in “emblems,” or illustrated poetry/prose broadsides, which seem to be what finally endeared him to the Queen and her peers. Probably they were more or less accurate; the Queen was no fool. And, while officials and moneylenders came to hate him, George was popular and made permanent and loyal friends. He was, as well as talented, fundamentally honest, well-meaning, and brave. But he was impulsive. He was also, when he married, broke and alienated from his father. He’d basically squandered his inheritance in the attempt to hang out with the wealthy aristocracy and become a courtier, and Sir John, fearful of being held responsible for further debts, had disinherited him. So George may have married for reasons other than love. Or as well as love. Whatever, he must have been happy to move into Elizabeth’s fine house on Red Cross Street, thinking himself in a much better position to pursue preferment at court. Litigation was to go on for years. In the meantime, the Mayor of London intervened to protect the property of Elizabeth’s children against their new stepfather. In May of 1563, he kicked George and Elizabeth out of the house. George took Elizabeth to Bedfordshire and lodged her in assorted rental dwellings. Attempts to reconcile with his father went nowhere, so by late 1564, George returned to Grey’s and his pursuit of preferment, now the only course available to him apart from soldiering. He was welcomed back to Grey’s as an “ancient” of the society after successfully completing some initiatory poetry challenges. George commuted between Grey’s Inn and Bedfordshire. Elizabeth gave birth to William in 1565. George was at Grey’s for another four years, in 1566 writing and (for the Christmas celebrations) staging the play Jocasta. Other plays and performances followed. Jocasta in particular was a hit, partly because it dealt with royal succession, a topical issue at the time since the Queen was still young enough to have children but had no husband. George made extra money from the printers at Westminster by translating some Italian classics — he’d long been studying Italian with Claudius Holyband, a Hugenot refugee. One of these translations, of Ariosto’s play The Supposes, was another hit at Grey’s. In 1568, Sir John died and George went back to Bedfordshire. As the eldest son, he inherited the estate. He immediately took out a mortgage for the entire value of the property, and a number of lawsuits were launched by the executor of the estate, by some of the tenants on the Gascoigne farm, and by George’s brother John. Sir John’s property, like Elizabeth’s, was frozen in court. On June 13, 1569, George was ordered to pay his debts or leave Grey’s. He left, and was soon sent to Bedford Gaol, a debtor’s prison. He did some patronage writing in jail, and one of his projects, a wedding masque for Lord Montague, earned him appointment to the seat of Middlehurst (Sussex) in parliament. This got him out of jail since MP’s for the duration of their presence in parliament were granted immunity from their debts. George was able, as he put it, “to show my face openly.” But ultimately he was not allowed to take his seat. The Privy Council, which had to approve all appointments, decided that he was “a common rhymer, a notorious ruffian, a spy, an atheist, and a godless person.” So much for George’s progress in making friends among the Queen’s top advisors, though Montague remained a permanent friend and patron. The only way George could avoid returning to Bedford was by enlisting. Soldiers were needed for the Queen’s off-and-on wars against the French and Spanish in Flanders and the Netherlands. While they were in service, their debts were suspended. George joined a regiment raised by Captain Thomas Morgan and provisioned by the Queen’s top official, Lord Burleigh. The 300 men were reviewed by the Queen at Greenwich, in April 1572. Their mission was to defend Flushing in Holland, a port-city that guarded the passage to Antwerp, Europe’s greatest port. The English did great trade in Antwerp, sending their woolen fabric there to be dyed and sold. Flushing was also a convenient place for English ships to land troops. Morgan’s men joined up with a hundred men raised by Sir Humphrey Gilbert, Sir Walter Raleigh’s older half-brother and the Queen’s childhood playmate, and George served under the joint command of the two men. George was to spend the next four years in Holland. Before he left, in a final bid for patronage, he prepared a manuscript of all the poems and plays written during his years at Grey’s, and gave it to a Westminster publisher. 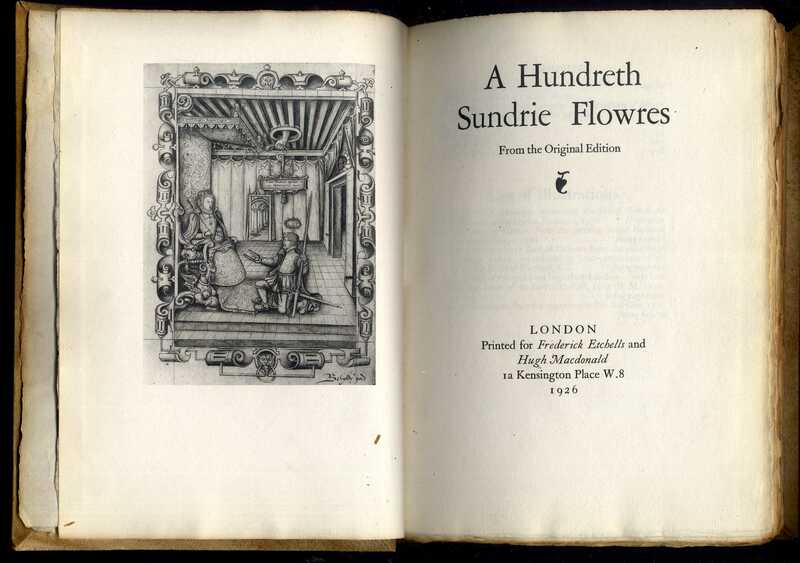 This is the book, entitled A Hundred Sundry Flowers, in which “Lullaby” appeared. Printers, who then functioned also as publishers, had found a market only for miscellanies, or anthologies, not for books by single authors. So George simply assigned his poems to various fictitious authors, some men and some women, and called the book a miscellany. He identified the authors by giving each a motto and an introduction by the gabby and gossipy fictitious editor G.T. In this way George could comment on his own poems, which is very modern or even postmodern. Also he hoped through anonymity to protect himself from accusations of libel and obscenity as some of the writings in the book are sexually explicit, at least in Elizabethan terms. Fifty copies were confiscated by the authorities, and the book was banned at the insistence of the religious members of the Court of High Commission. This of course increased sales. When George came back on his next leave he found himself to be famous. Back in Holland almost immediately, because the Spanish were attacking Walcheren Island where Flushing was located, he corrected and revised the book, added more items to it, and send it home to be published, under his own name, as Poesies (1575). That version was confiscated too, but finally released for sale. George had done a good job of “sanitizing” his writing and playing the reformed rake, the prodigal son. 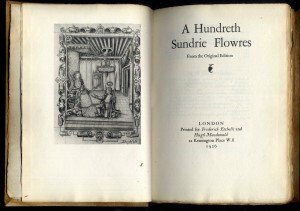 Discriminating readers, then as now, prefer the Hundred Flowers to the Poesies, but really George hadn’t changed his book that much except for adding profuse descriptions of how reformed he now was. He’d also done a good job of soldiering, attracting in the battle of Middleburgh the attention of the Prince of Orange, the overall commander of the Dutch, English and German forces. He was made a captain. By spring, 1576, when he came home for good, he had enough reward money and booty to pay his “scores.” Likely his rank also helped to line his pockets. Captains were front-line officers but also the army paymasters. It was common practice for them to fudge their accounts by claiming pay for more men than they really had. It must have been good for William, now 11 years of age, to have a father who was getting ahead if not by any means secure, and at home at least some of the time. George writes of his return that he is now “amongst my books here at my poor house in Walthamstow,” adding, “where I march among the muses for lack of exercise in martial exploits.” This particular “march” turned out to be more lucrative than any George had gone on in Holland. Work came pouring in. George was finally where he wanted to be. The printer Christopher Barker immediately commissioned him to translate a French book on hunting. The published work included drawings, done in reverse to transfer to blocks of wood, of the Queen hunting and hawking, two of her favorite activities. The fact that George could draw would’ve been important to Barker; pictures were so expensive to print that the cost of them was usually charged to authors. George put himself in all these drawings, showing himself in favor with the Queen. Barker’s commission may have led to Leicester commissioning a play for his three-week-long entertainment of the Queen in July 1575. The Queen never saw the play, Zabeta, because she got wind of its topic in a preview. That topic, assigned by Leicester, was a marriage of a Queen to her favorite courtier. Offended, Elizabeth left, but Gascoigne, there to act in his play and other events as Sylvanus, a man of the forest, clad in ivy and armed with bow and spear, jogged beside her carriage reciting an apology he had contrived. He won her forgiveness, and Leicester was most appreciative. George was invited to participate in the exchange of New Year’s gifts at court. His gift was an illustrated manuscript of Sir Henry Lee’s The Tale of Hermetes the Hermit, translated into Latin, Italian and French. The illustrations were George’s, and all of them are autobiographical, including the frontispiece with George’s motto hanging in the air over George as he kneels before the Queen. In January, George brought together a long-poem satire that he had been working on since the previous summer, the Steel Glass (referring to a polished copper-tin mirror). It was published in February 1576 and contains an introductory poem by Raleigh — Raleigh’s first published poem. In March George published an account of the Queen’s entertainment at Kenilworth. These entertainments were lavish, to the point where they could seriously break the budgets of the Lords and Ladies who had to stage them. In April he wrote a forward to Gilbert’s Discourse to Prove a Passage by the North West to Cathay, and paid to have it published. Gilbert had been circulating the pamphlet in manuscript form for some years, and had gained the support of many great men (Leicester, Sir Philip Sidney, Burleigh, Walsingham etc) for an expedition led by Frobisher to find a northwest passage to China. The pamphlet sold well and provided more backers. The Queen gave her approval (but did not contribute). Frobisher set out that year, the first of many voyages to what is now Canada. One of these voyages, by Gilbert, in 1578, resulted in the English claiming Newfoundland, their first colony. Other books were finished that spring and summer, despite George being, as he says in one of his prefaces, “in weak plight for health” in April and May. Then in September Walsingham commissioned George to go on a fact-finding mission to Antwerp. Leicester may have been behind this appointment. George was to report to Walsingham and Burleigh. He went to Paris as a diversion, informing Burleigh of his arrival on Sept. 15. Early in October he traveled to Antwerp. He was there on Nov. 3, staying at an English merchant’s house near one of the English docks, when mutinous (unpaid) Spanish troops suddenly sacked the city. Eight thousand people died, one thousand houses were destroyed. George worked to protect the English merchants trapped in the city. He arrived in London on Nov. 21 and reported to Walsingham at Hampton Court. Walsingham, who had already received letters of appreciation for George’s help, gave him permission to publish the report and George did so immediately; The Spoils of Antwerp appeared in late November, 1576. In January 1577 George sent an emblem to his wife’s influential first cousin, Sir Nicholas Bacon. The Latin motto says “He who becomes wise late in the day, eventually, nevertheless, becomes serviceable.” George was using his growing respectability in court to get in with his wife’s family. But George’s illness returned and, on October 7, 1577, he died. Some historians think the disease might have been malaria, contracted in Flanders. He was only 39. William was only twelve, and with no real inheritance. He would not be able, unless his mother could influence her own family to support him, to go to university, or to study law. You will vouchsafe to aid her and my son. Beyond deserts who still rewards bestows. Since Whetstone immediately published his Remembrance of the Well Employed Life and Godly End of George Gascoigne, Esquire, Elizabeth and William would doubtless soon have heard about or read it. They knew that George was thinking, first and foremost, about them, that he was worried, and that he felt he had short-changed them. Bequeathing William a debt of service to the Queen is pretty lame, as is asking the notoriously parsimonious Queen to look after his wife and son. But maybe it wasn’t such a longshot. If George said something like this to Whetstone, he might’ve felt that he had made an impression on the Queen, especially at Kenilworth. The fact was that in turning up on Drake’s expedition eight years later at the age of twenty, William would be paying a debt of service, putting his life on the line for the Queen. It may seem rather young for him to be doing this, but in those days it was not uncommon, Raleigh being a famous example, a seasoned soldier by age 16. Paying the “debt of service” bequeathed him by George would put William in the way of preferment. So Drake’s voyage was a rare opportunity, and William might have used some of his parents’ connections to get it. Nicholas Bacon was close to the Queen. The Vice-Admiral of Drake’s fleet was Frobisher. And maybe the Queen herself was answering George’s last petition. Drake would’ve been flooded by volunteers wanting to serve on his expedition. He was England’s most successful pirate — a government-approved one, as anything was good that weakened the nation’s great adversary Spain and forced Phillip II to postpone or cancel his long-expected attack, which came three years later. Delaying or weakening the attack by draining his coffers was one objective of the expedition — the one argued by Walsingham. Also, Phillip, angry about English assistance to the Dutch and at English piracy, especially Drake’s, had just ordered an embargo on English goods in Spain and English ships in Spanish harbors. This angered the Queen, who was all for open trade and the taxes it produced. Because of this Drake’s fleet was larger than usual: 21 ships. The ships carried 1,800 soldiers, and they were well trained. This was to be the biggest raid to date on Spain’s empire, and it was meant to extract the biggest possible toll. So it was likely that the expedition would prove economically as well as politically lucrative, as had all of Drake’s previous expeditions. Expeditions were joint-stock affairs in those days. Drake had a record of success and had no trouble selling shares; the Queen herself was one of his biggest investors, and this fact encouraged others. Those that Drake took on board as soldiers and sailors also got a share. William sailed with Drake from Plymouth on Sept. 14, 1565. First they attacked Santiago in the Cape Verde Islands just off the coast of Spain. Finding no treasure, they torched the town. Then they crossed the Atlantic, some three hundred men, both mariners and soldiers, dying on the crossing, most likely of scurvy. They were heading for Santo Domingo, the capital of Hispaniola and the oldest Spanish settlement in the New World. Drake landed his army at night, six miles down the coast from the town, and they marched through Bocagrande to Punta del Judio (where the naval club is today). They came up behind the city, a wall that was relatively unprotected because the Spanish were focused on the harbor. Later the Spanish built a bulwark, which is still there today, at the point of attack. There were few losses after that; once the English entered the town, the Spanish garrison quickly surrendered, and most of the citizens had been evacuated. So there’s a good chance that William, if he didn’t take ill and die in the middle of the Atlantic, was killed where the bulwark is now. The Bedfordshire records say he died on the voyage, and that may have been meant specifically.